The bag sleeve is a fun variant to the wide angel-wing or trumpet type houppelande sleeve, for both men and women. The problem is that there are some commercial patterns available for houppelandes that lead the newer costumer astray, by solving the bag sleeve issue as if it were some sort of two-dimensional kimono sleeve. 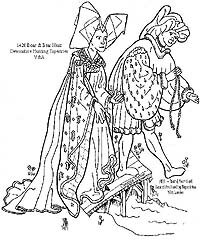 Even though these patterns generate the "big dress" style of houppelande, rather than the very full circle plan, you can still get a very nice looking houppelande from them -- if you make your own sleeve. Let's start with three contemporary representations of the bag sleeve. These are all men, but women wore the bag sleeve as well, although possibly without the slit option. 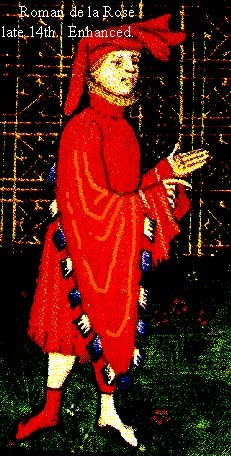 An illumination from late in the 14th Century. I have enhanced this scan so that you can see the folds; please consult Boucher: 20,000 yrs of fashion for original, p. 196. The seam on this sleeve is along the back of the arm, which allows for dagging to be inserted. The top of the sleeve may be very full; it's hard to tell, but there is more fabric in the sleeve than a simple flat style of sleeve would produce. It is less full than the following two examples. I believe that the extra folds of fabric between the wrist and the white band a few inches up the arm are some sort of decoration on the next layer in of his clothing. On the other hand, they're the same color as his houp. A statue of a wealthy man. Note how full the sleeve is, down around the circular wrist opening on the left sleeve. His left arm is through the fur-edged slit, his right arm is through the wrist opening. Notice how much fabric is ballooned out where his right elbow bends. This is a very full sleeve, for most of its length. It may be narrower at the sleeve cap. Another wealthy man, out hunting; a tracing from a picture of the tapestry. Notice the way the sleeve falls, as if it were very wide from the sleeve cap to the wrist. It's like a blouse sleeve, but much, much wider. Notice all the folds as the fabric drops away from his arm. In the original, the little white "raindrops" on the one sleeve issue as if from the white "cloud" at the sleeve cap, against the deep blue of the houppelande. They could be embroidered, or they could be little metal tags (called "mounts" by the archeology folks) that were applied to the fabric. 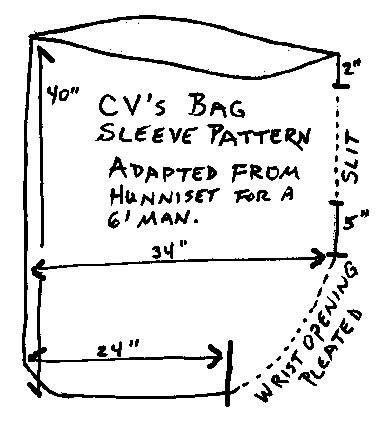 Here is a drawing of the sleeve pattern for the commercial houppelande pattern that many people use. This results in a sleeve that is pretty much no different than if you taped a half-circle of fabric to the underside of your arm, from shoulder to wrist. It does not move, it does not drape. It has no fullness at the wrist or the sleeve cap, because all that has been edited out for you. My very first houppelande was from one such commercial patterns, and the sleeve was very awkward-looking. I felt as if I had giant upper-arm-flab-wings on. I encourage you to never, ever use this type of sleeve pattern. Here's a drawing of my final design; click on it to see the larger version. The drawing can be a bit confusing, because the swoop of the common "bell curve" for the sleeve top is rotated so that the seam is in the front of the sleeve, (some of which is left open for the slit) and the fold goes where the usual back seam for a fitted/jacket type sleeve would go (think of a man's suit coat.) Bag sleeves without slits may be made with the seam at the back. This pattern is really very similar to a cylindrical sleeve with some editing at the bottom. In this drawing, the sleeve is folded along the back edge. To use, you would figuratively "unfold" the image so that you have something that looks a little bit like a pair of sunglasses, or an upside down "m". One side of the pattern would take the top line, for the sleeve cap, and the other side takes that scooped second-from-the-top line, for the armpit. Which side goes with left and right arms depends on how you lay it on the fabric. This pattern produces a full sleeve, with sweeping folds, and a great drape whether the arms are through the slits or through the wrist openings. A less full sleeve, that produces the bag effect, but won't give the arm-flap effect of the grey pattern above, would be a common set-in sleeve that has been widened up to twice its usual width. The fullness will hang below, without the full drape of the Hunnisett version. This is a picture of my husband in his new houppelande with the modified Hunnisett sleeve; you can see more pictures at my circle-houp page.